Two police cruisers crashed as officers rushed to the scene of a shooting in Manchester, New Hampshire. 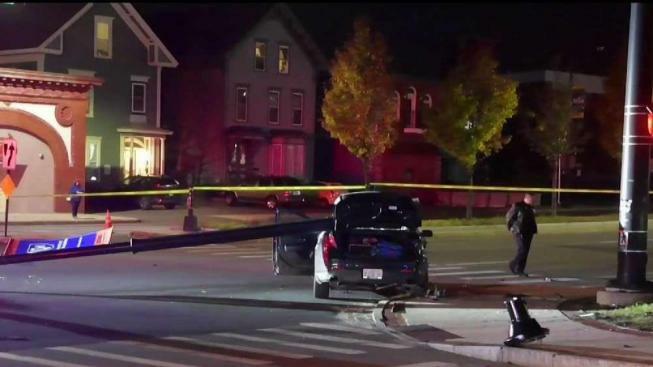 Two police cruisers collided while responding to a shooting Monday evening in Manchester, New Hampshire. The shooting took place near the intersection of Notre Dame Avenue and Conant Street around 6:30 p.m. A 20-year-old man was transported to Catholic Medical Center. His condition was not made clear. As police were responding to the shooting, two cruisers crashed. Two officers were taken to Elliot Hospital with non-life-threatening injuries. The shooting and the crash are under investigation.